Samsung has filed a patent regarding a wearable device that comes with an extended curved display. The electronics giant has filed the patent at the US Patent and Trademark Office (USPTO) that has been published under the patent number US D813,864 S “Wearable Electronics Device”. According to the patent sketches, it looks like a smartwatch with a rectangular display, which can extend along the width to almost twice its size. 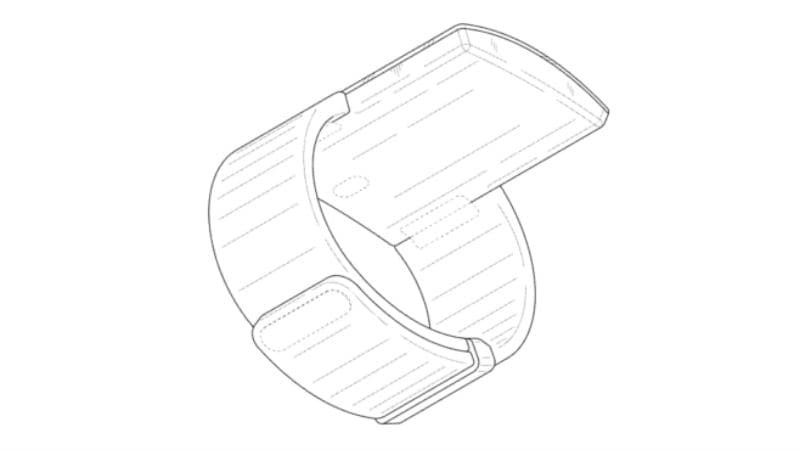 First spotted by Android Headlines, the patent shows that the screen is uniform with the watch’s band and it can be curved in a way that the device will appear to be stuck to the user’s arm, extending down the arm toward the elbow. Also, the band seen in the sketches seems to slide along a double loop. Interestingly, Samsung’s famous oval-shaped button can be seen on the watch frame, similar to how it is visible on the Samsung’s smartphones. It remains to be seen if Samsung will launch such a device at all. Companies use patent filings to secure a particular design for their future products. It is up to the companies to keep or discard them. As of now, the patent does not reveal too many details about the device. There is also no way to tell how Samsung will execute the idea as there is no information on what materials it will use to make such displays. Given that we see so many patents every now and then, several of which do not release, they should be taken with a pinch of salt. Having said that, Samsung is already expected to be working on a foldable smartphone that may be released this year. With the company said to have showcased a fold-in and fold-out design of the new foldable smartphone to select clients at CES 2018, it will not be surprising if Samsung decides to unveil a wearable with a curved display. iPhone lock: Did hackers drive Apple to kill iCloud activation checker? VW CEO counts on diplomacy to ease trade spat with U.S.
Apple Rents SUVs From Hertz To Test Self-Driving Vehicle Tech: Is Project Titan Too Far Behind?